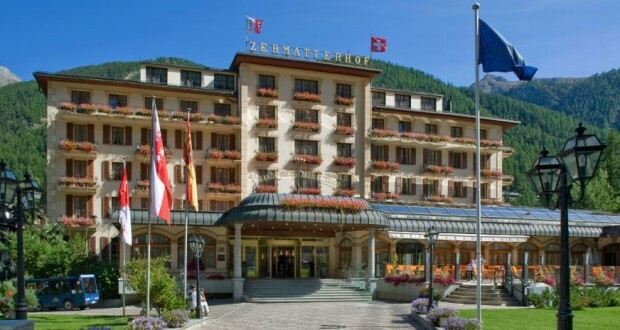 The Grand Hotel Zermatterhof enjoys a long tradition of elegance and style. Over the years the hotel has been renovated on a continual basis as well as equipped with the latest technology. The hotel has a total of 78 rooms with 137 beds, of which 35 are suites. The majority of all the rooms benefits from a view of the Matterhorn. In matters culinary, our guests are pampered by French-Italian cuisine in the cultivated ambience of the “Prato Borni” restaurant. And those seeking an additional gastronomic adventure will also find the very venue in the hotel’s “Lusi” restaurant, which brings a touch of the Mediterranean to the mountain world with its lighter dishes. In addition to its restaurants, the hotel’s “Matterhorn-Saal” and “Salon Ruden” offer banqueting and conference facilities of a superlative quality for weddings and family festivities, as well as for conventions, meetings and seminars. Our guests can enjoy an aperitif or a nightcap in front of the crackling open fire in the “Rudenbar” as well as in the cosy “Stars Bar” piano bar. “Vita borni” (life from the source) is the name of the Alpine wellness zone in the Grand Hotel Zermatterhof. A large pool with a waterfall, a generously-proportioned sauna landscape as well as various treatment areas and a private SPA for couples await you.